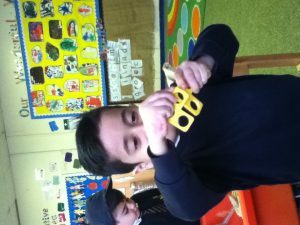 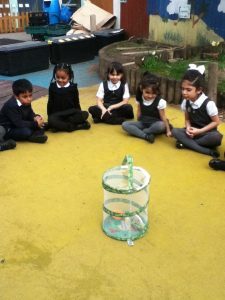 A couple of weeks ago we had some caterpillars in Reception and Nursery. We watched them grow and spin their cocoons. 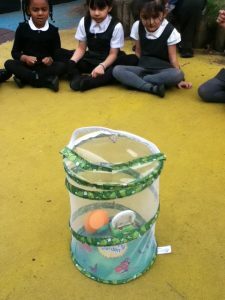 We waited patiently and over the weekend the butterflies pushed their way out of their cocoons. 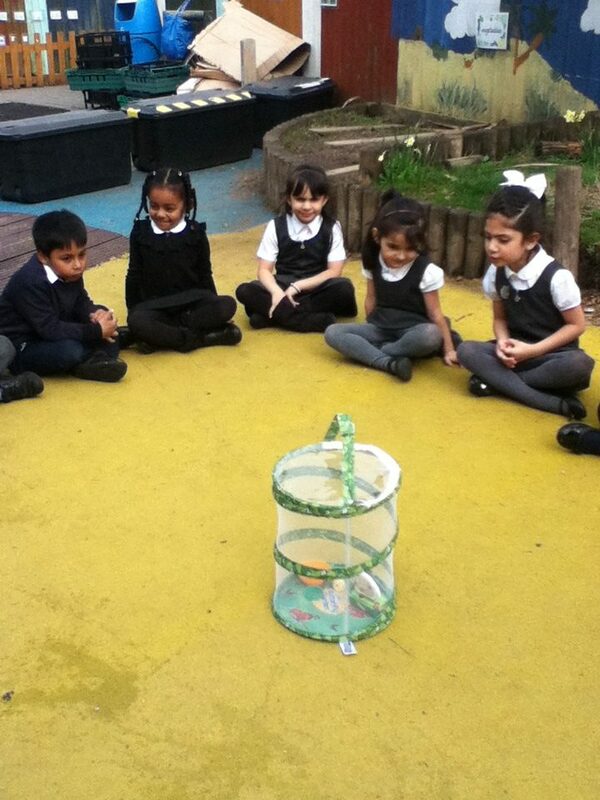 On Tuesday we set them free to explore the big, wide world. 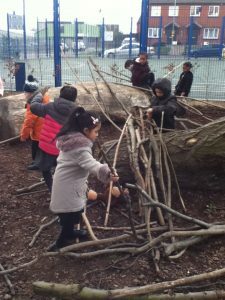 It has been amazing to watch the changes over time. 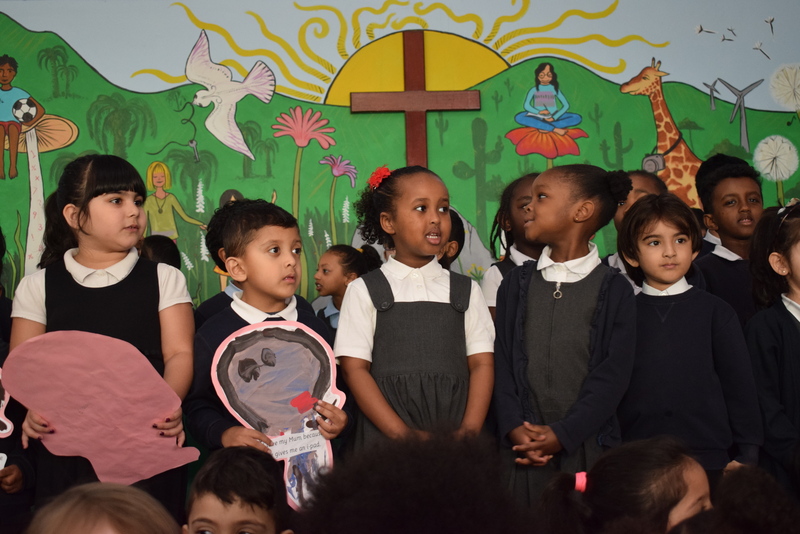 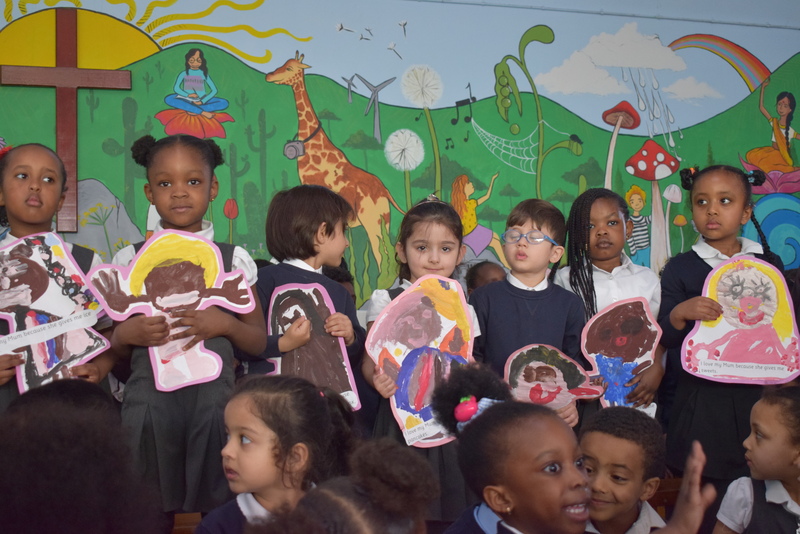 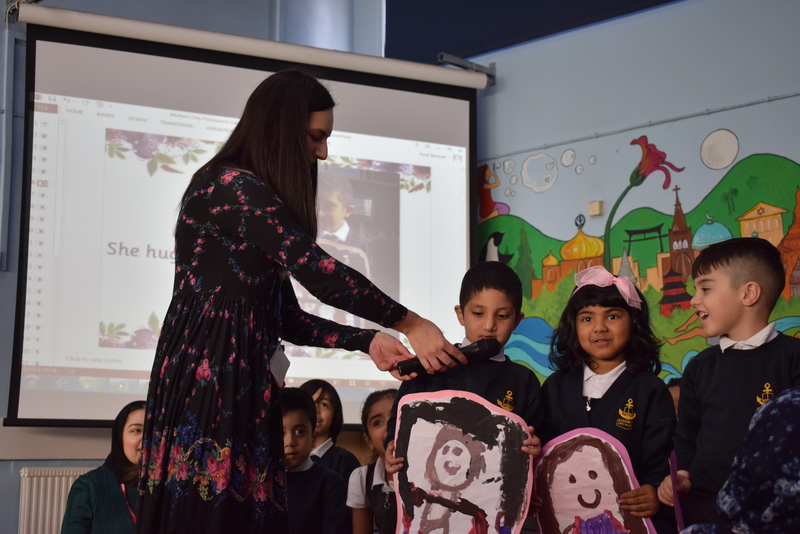 Thank you to all the mums, aunties, grandmas and carers who attended our Mother’s Day assembly today. 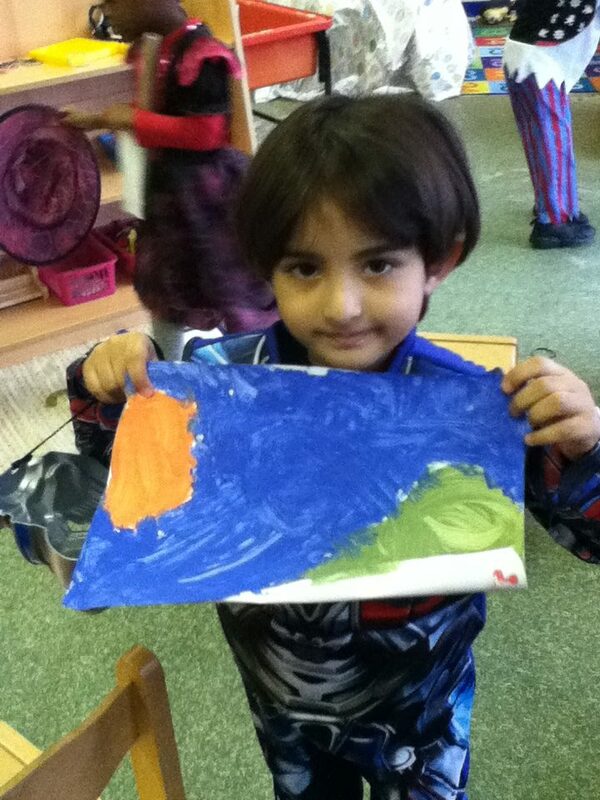 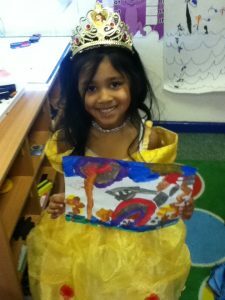 Reception really enjoyed painting pictures of their mummies and talking about why they love them. 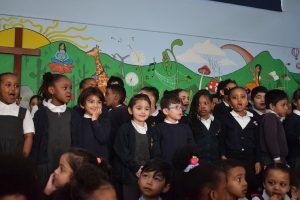 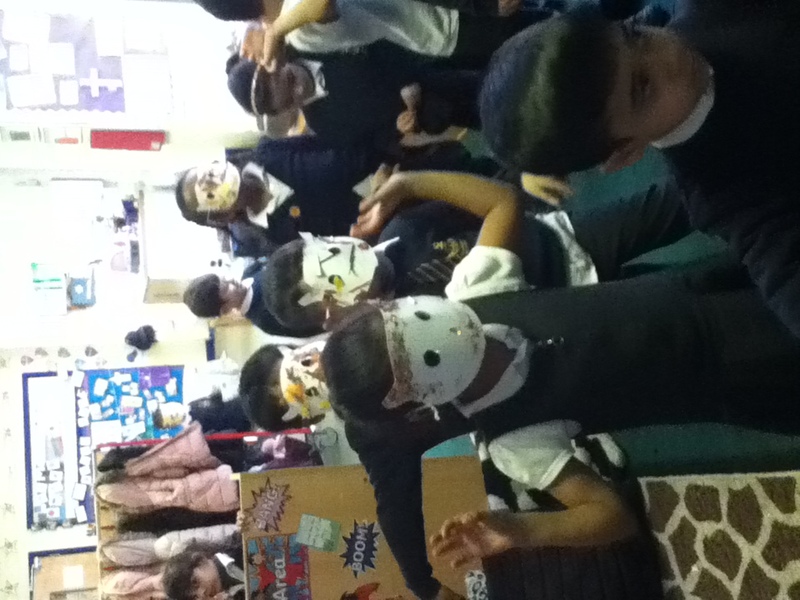 They practised really hard with the singing over the past two weeks. We hoped you enjoyed it! 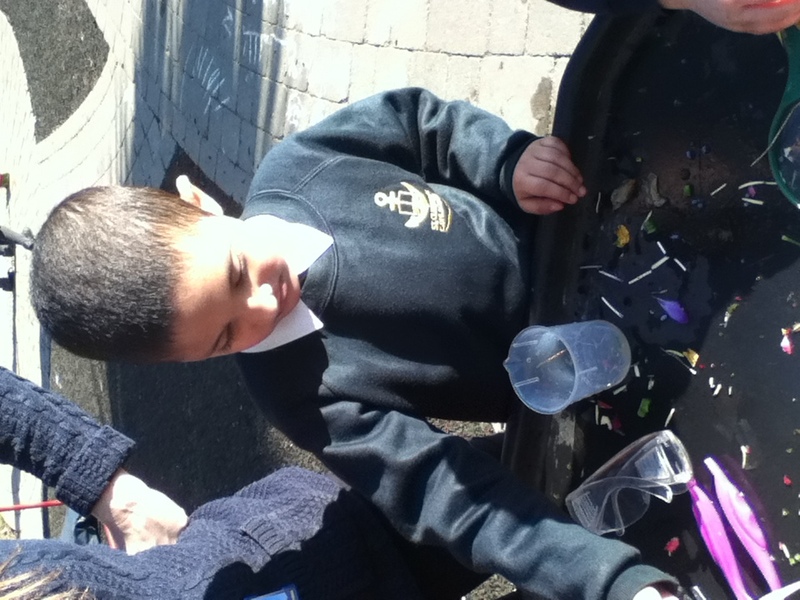 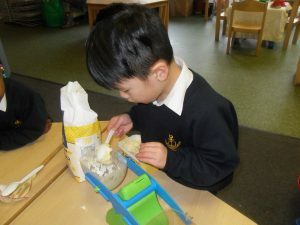 After reading ‘Where the Wild Things are’ the children designed and created their own boats for Max. 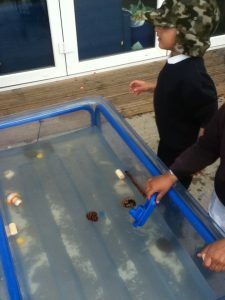 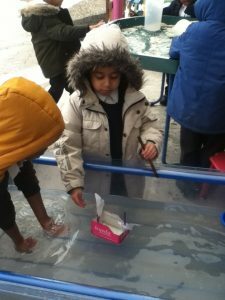 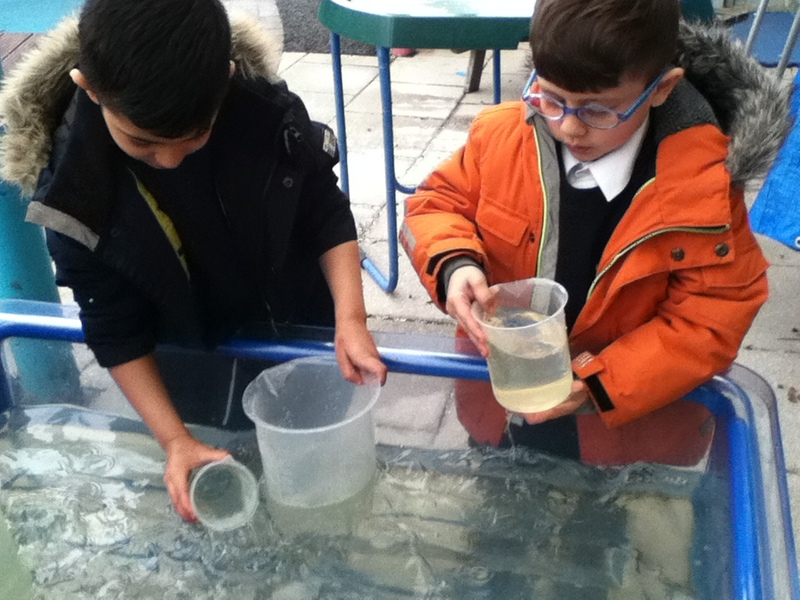 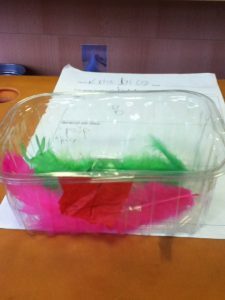 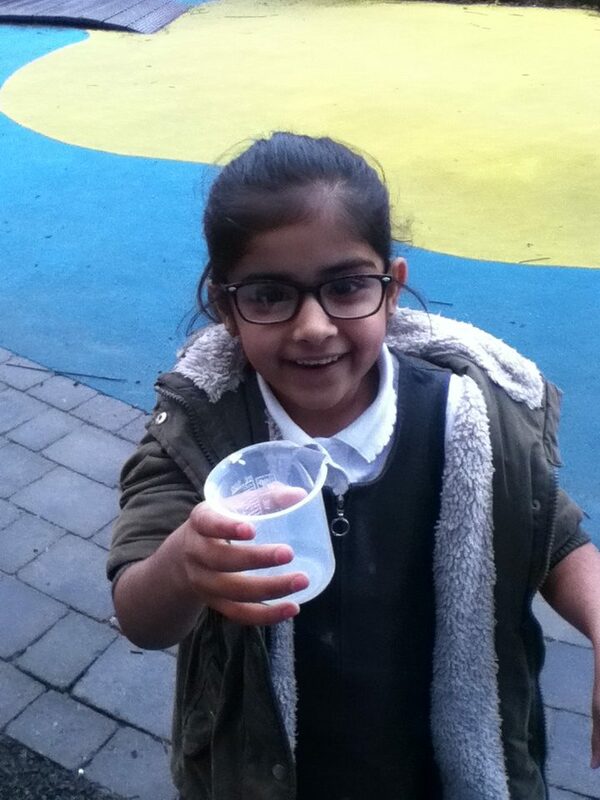 We tested them out along with other materials and objects to see if they floated or sank. 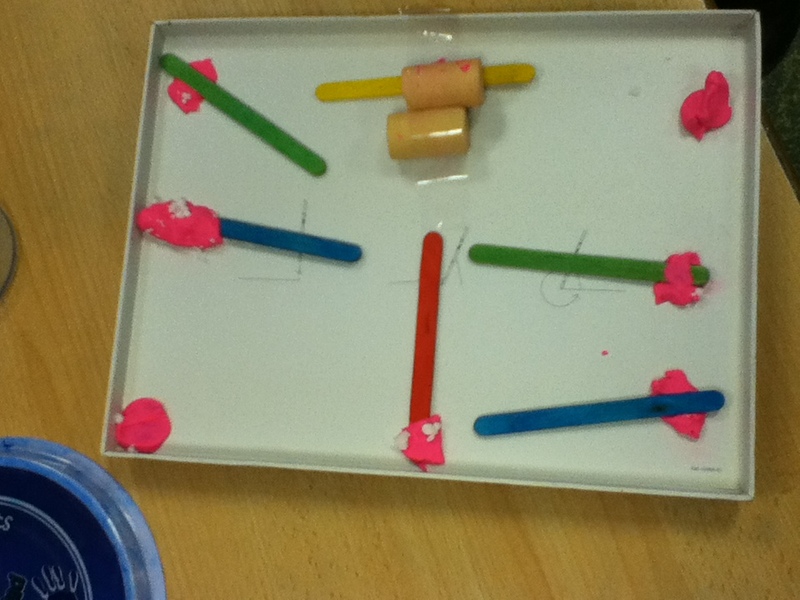 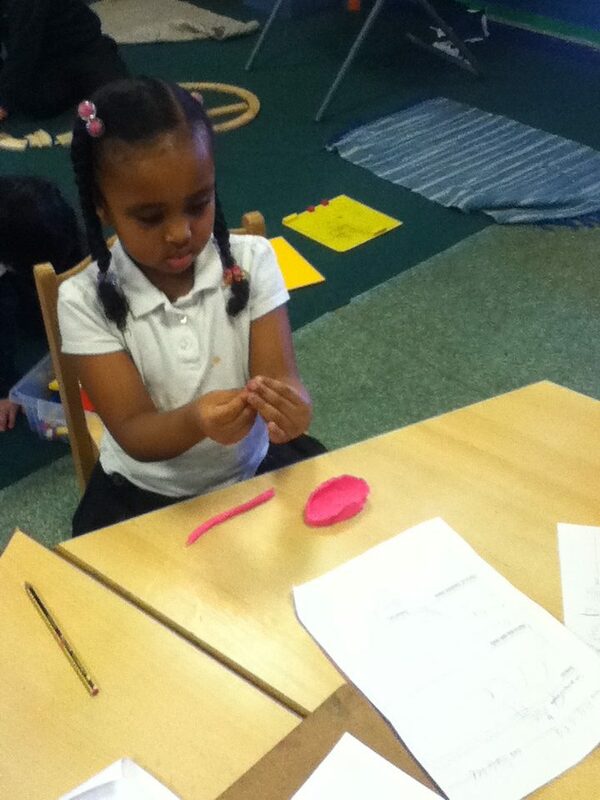 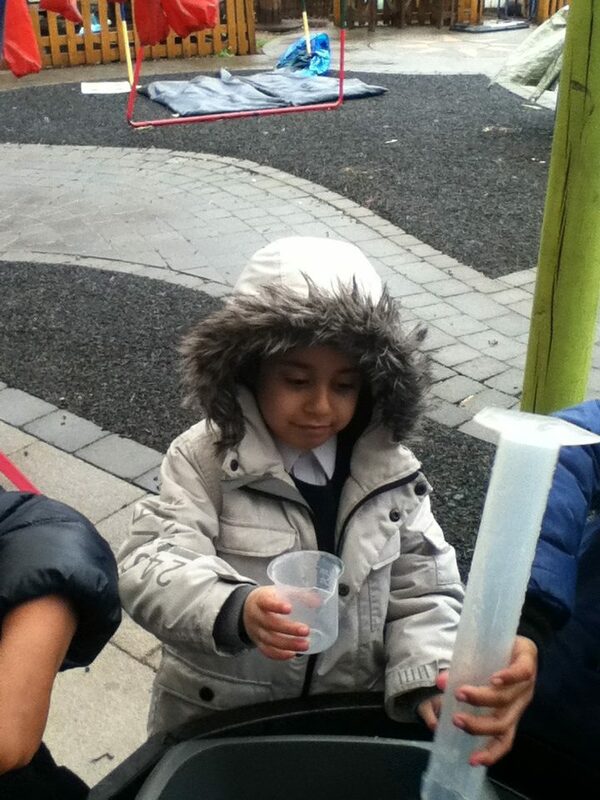 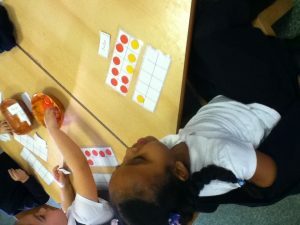 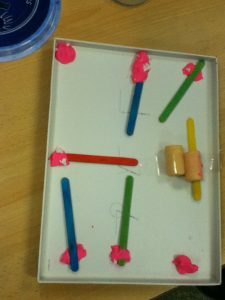 This week for Maths Reception have been learning about capacity. They have been able to recognise the amounts ‘full’, ’empty’ and ‘half full and half empty’ and have been using the language lots. 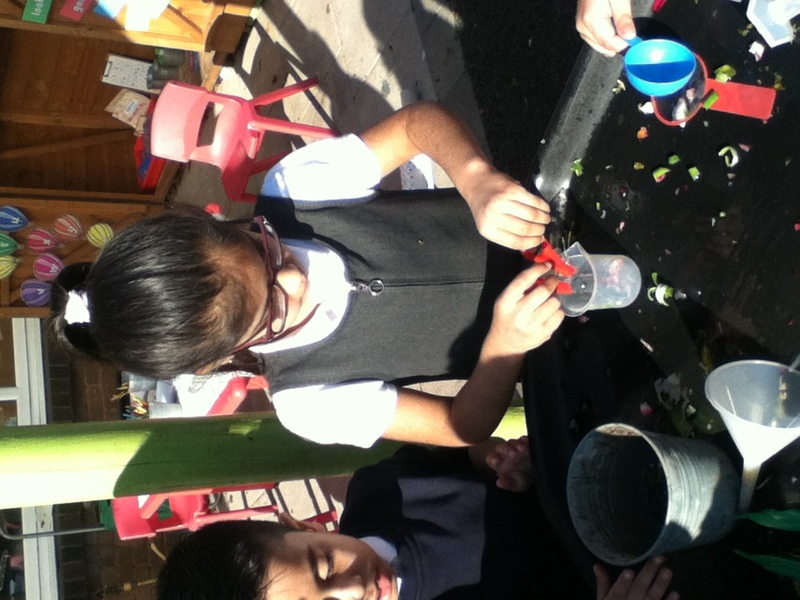 They used coloured water and rice to explore this. 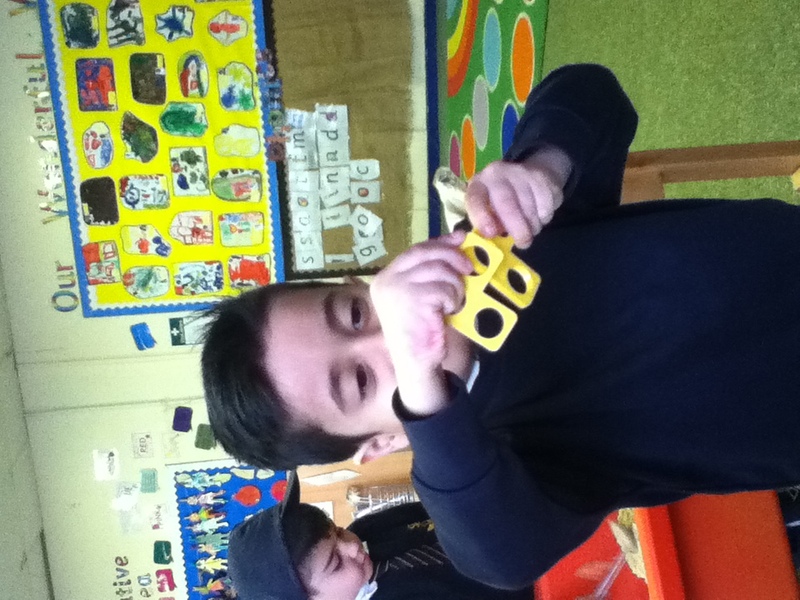 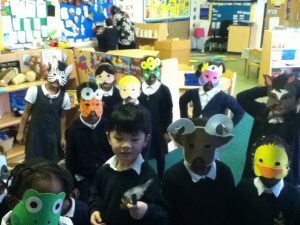 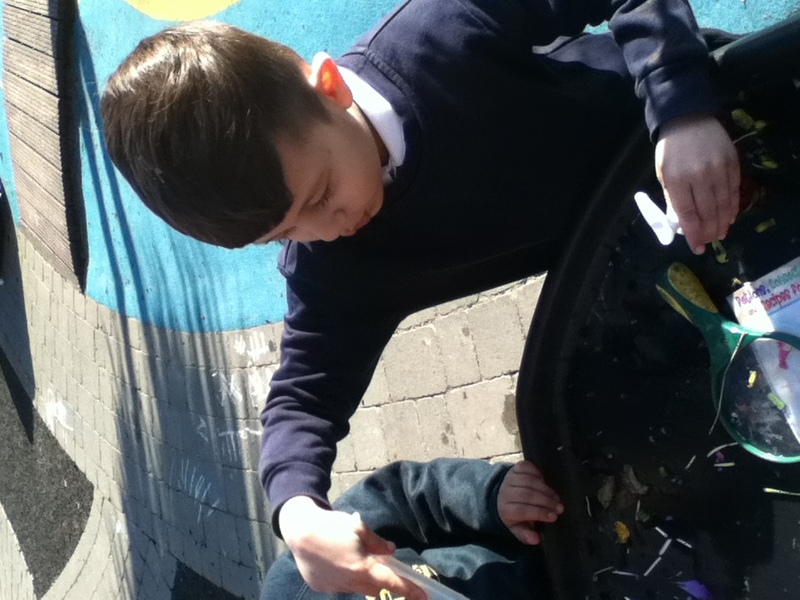 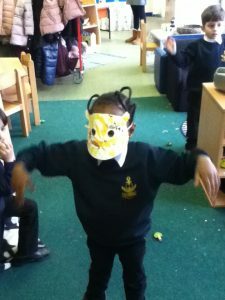 Reception have been focusing on the book ‘Where the Wild Things Are’. 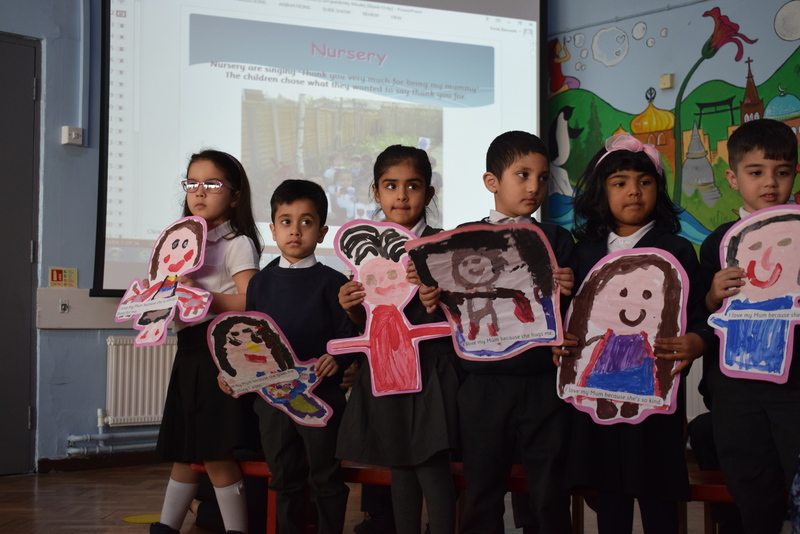 The children have painted pictures of the setting, they have labelled the characters, they have sequenced the story and written sentences to match. 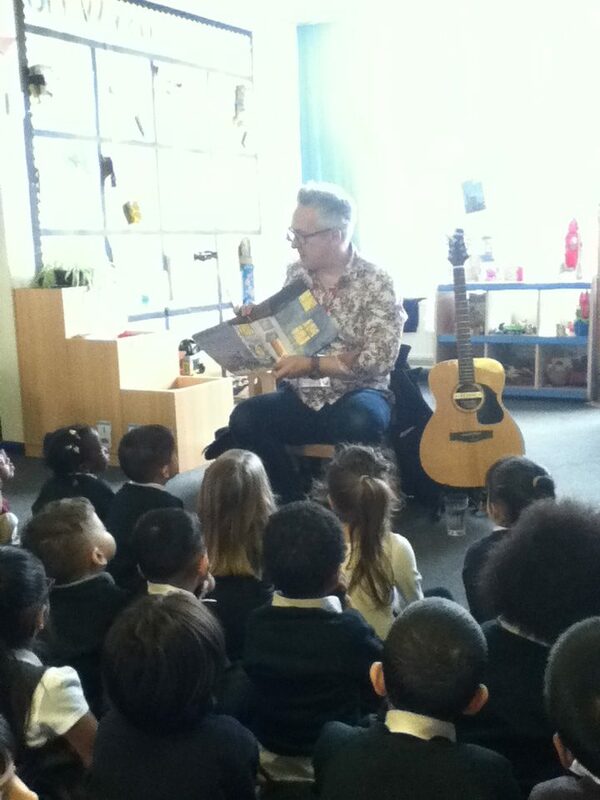 We had the author John Docherty visit us on Monday. 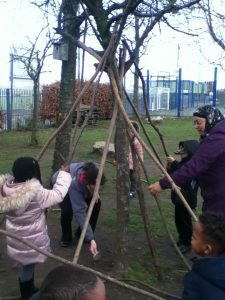 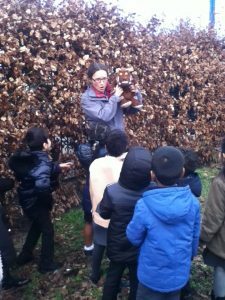 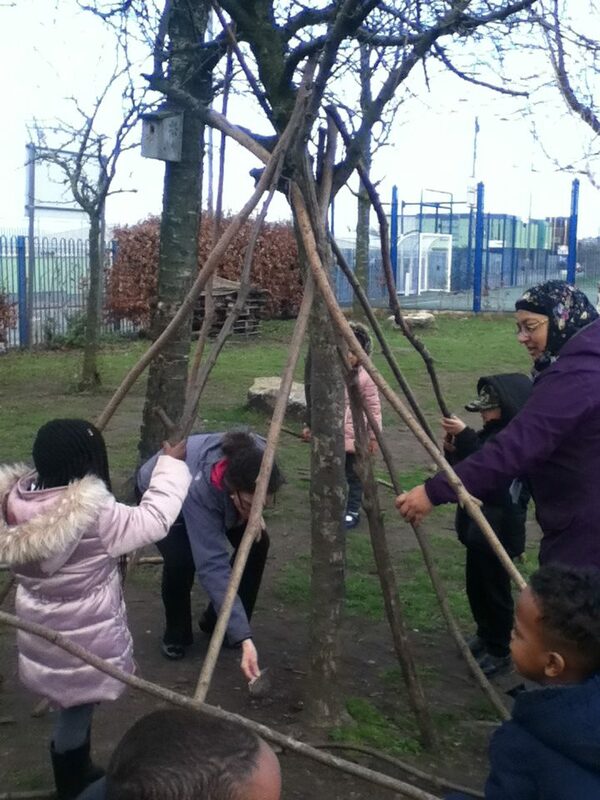 On Tuesday we went to the forest school area and we found a wild thing! 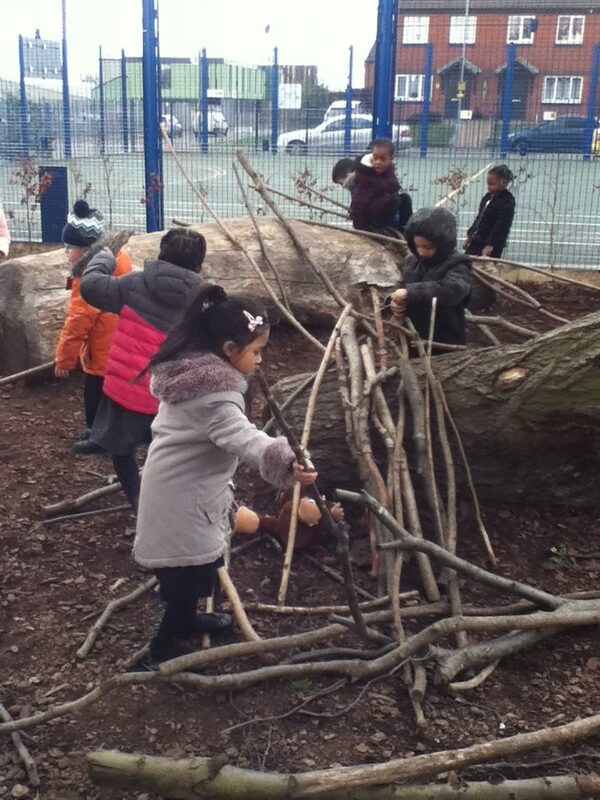 We worked together to create a den for it. He read his book called ‘There’s a pig up my nose’ which the children really enjoyed. He also sang a song about the story. 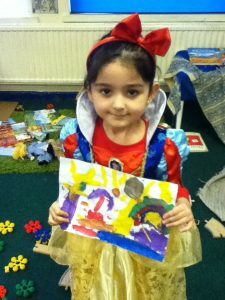 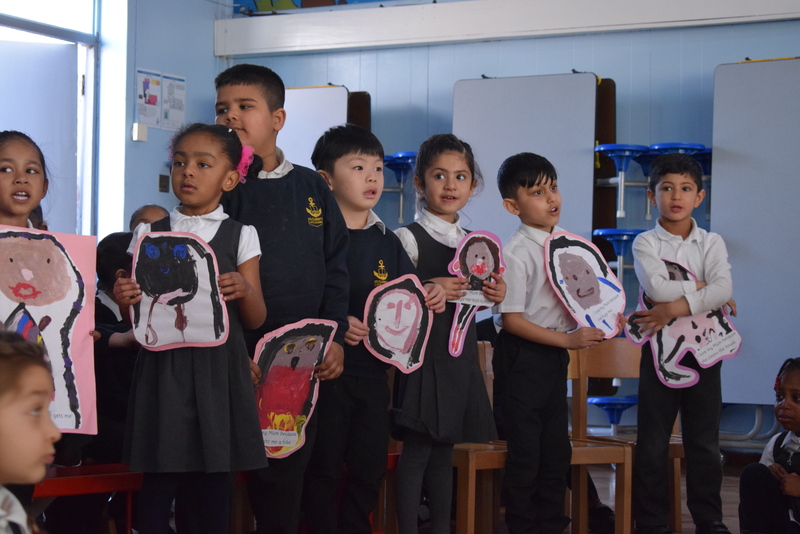 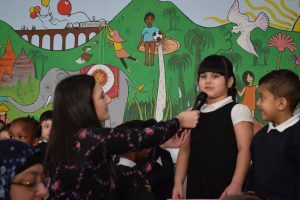 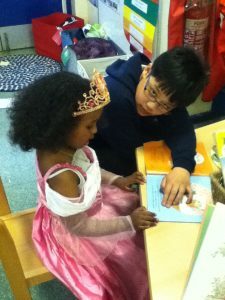 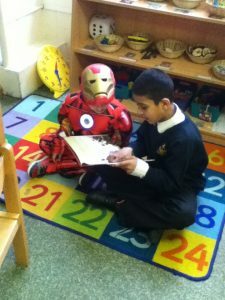 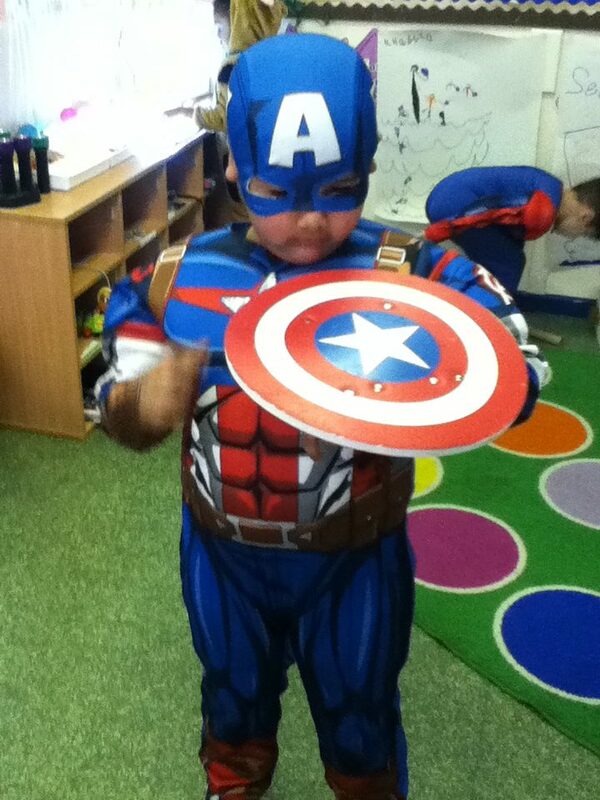 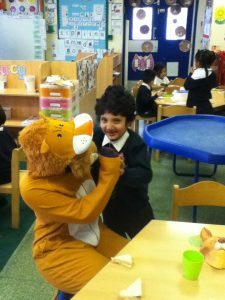 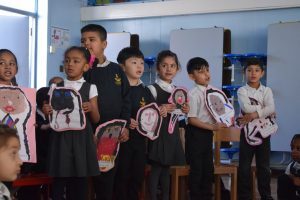 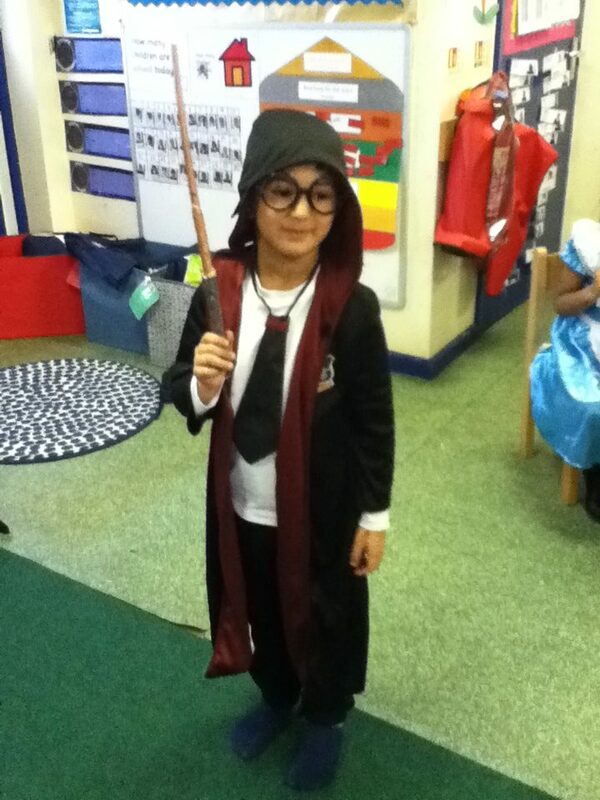 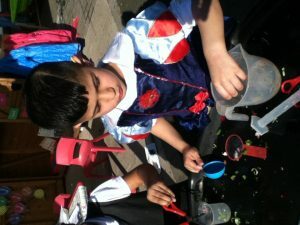 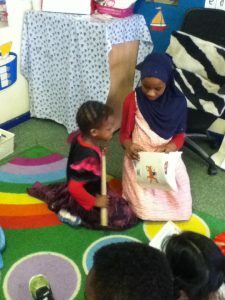 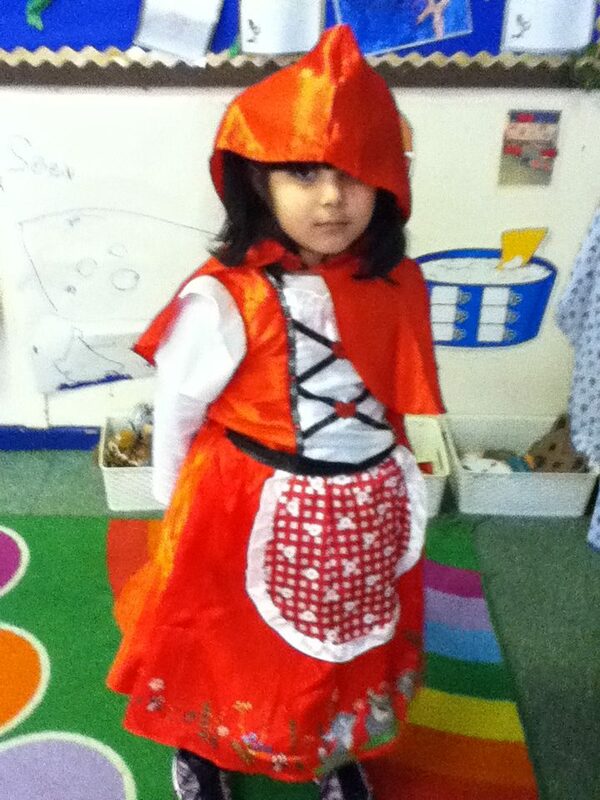 On Thursday the children enjoyed dressing up as different story characters. Year 5 came to join us to read the children their favourite books. 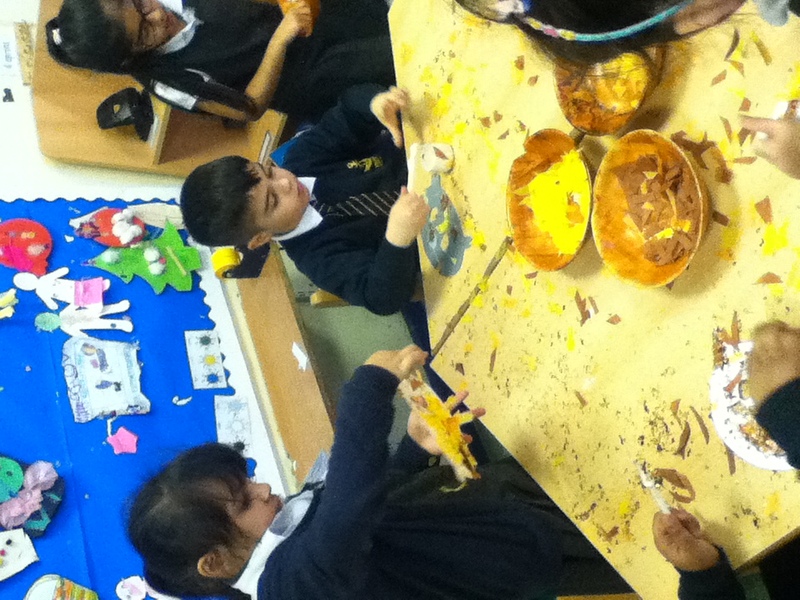 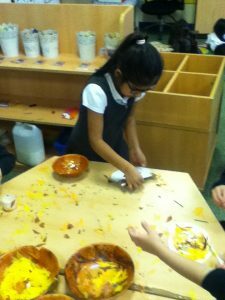 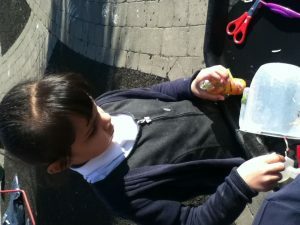 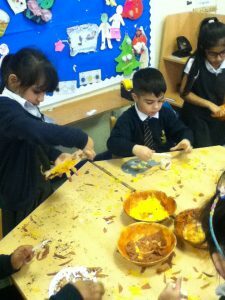 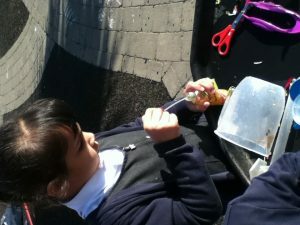 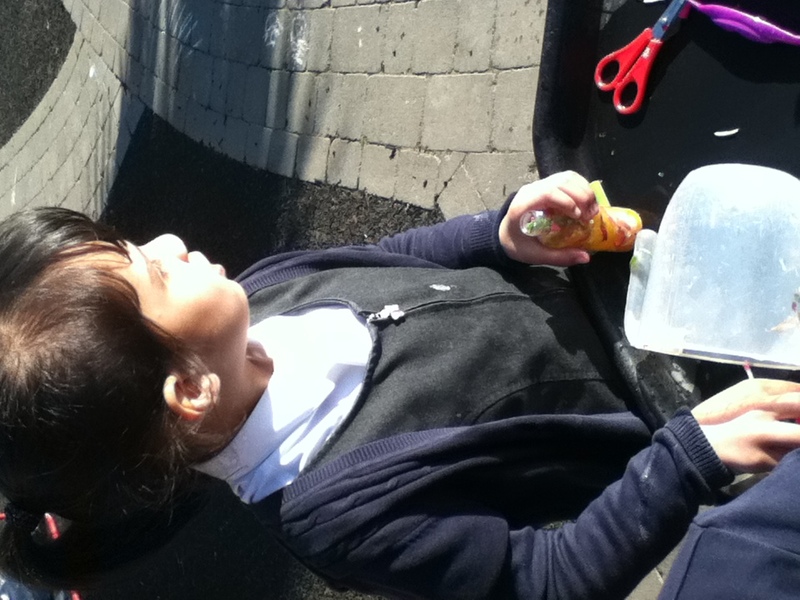 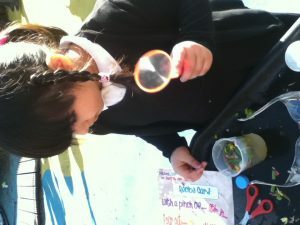 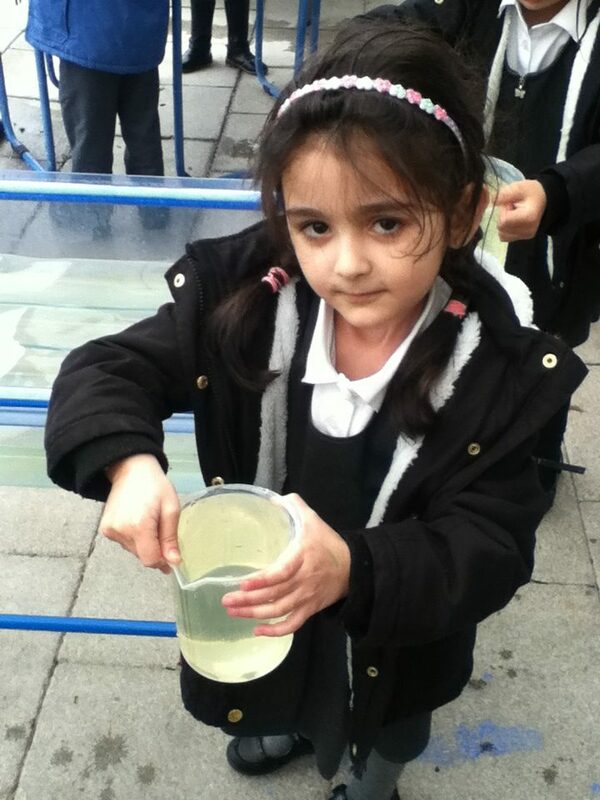 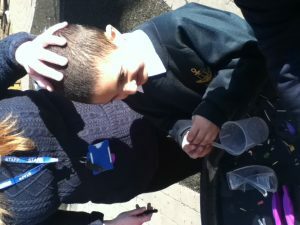 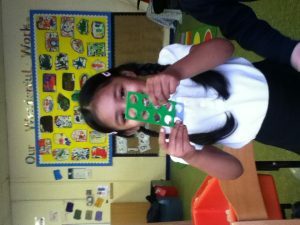 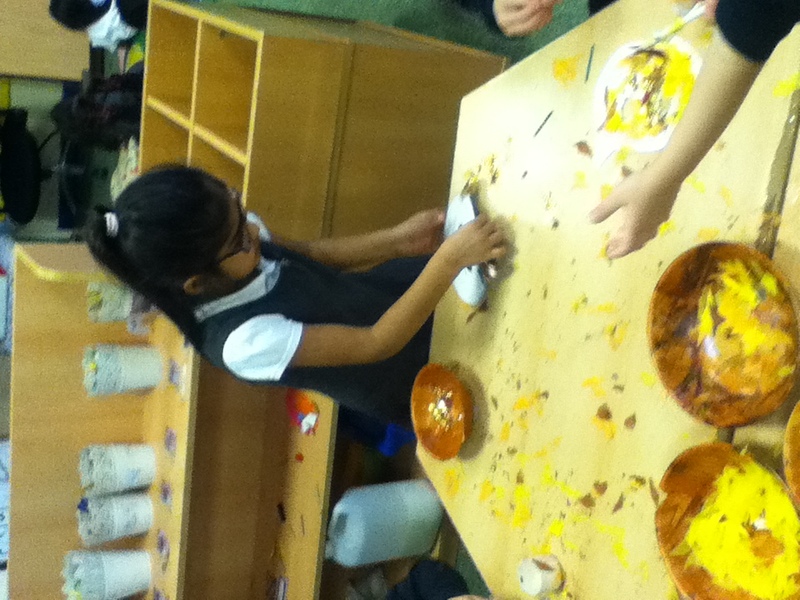 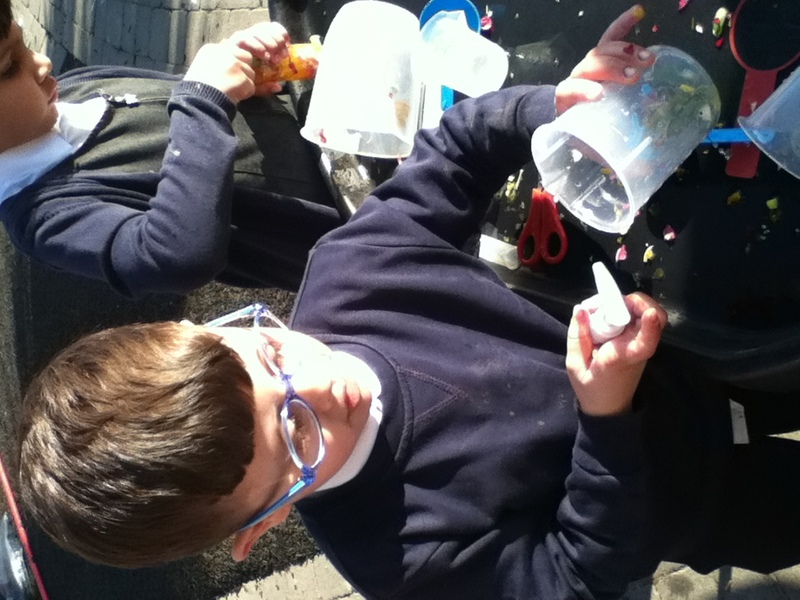 The children have been interested in making their own perfumes. 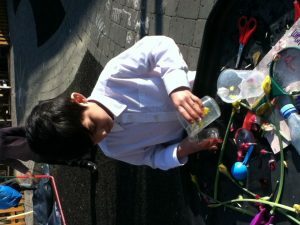 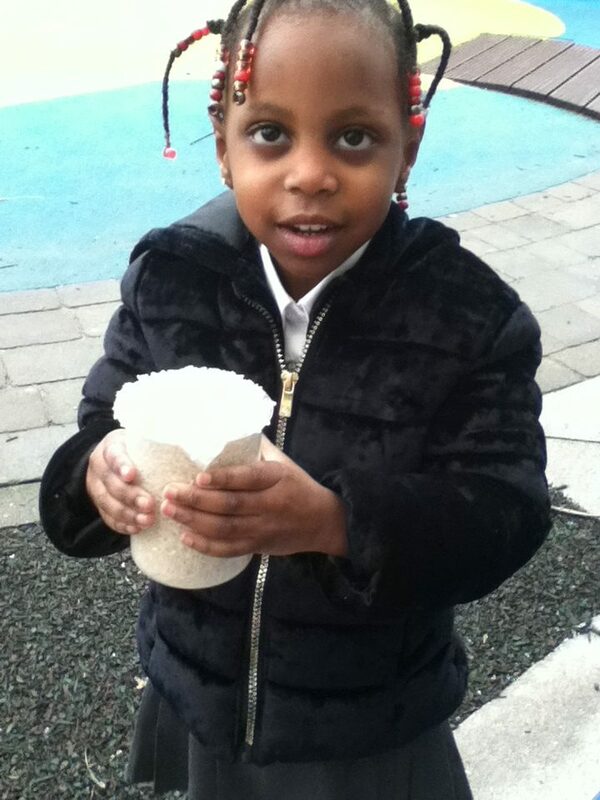 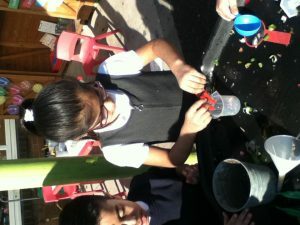 We got some flowers and bottles and beakers and funnels for the children to cut up the flowers and mix with water. Some children even made up names for their perfume such as ‘princess rose’ and ‘rainbow flowers’. 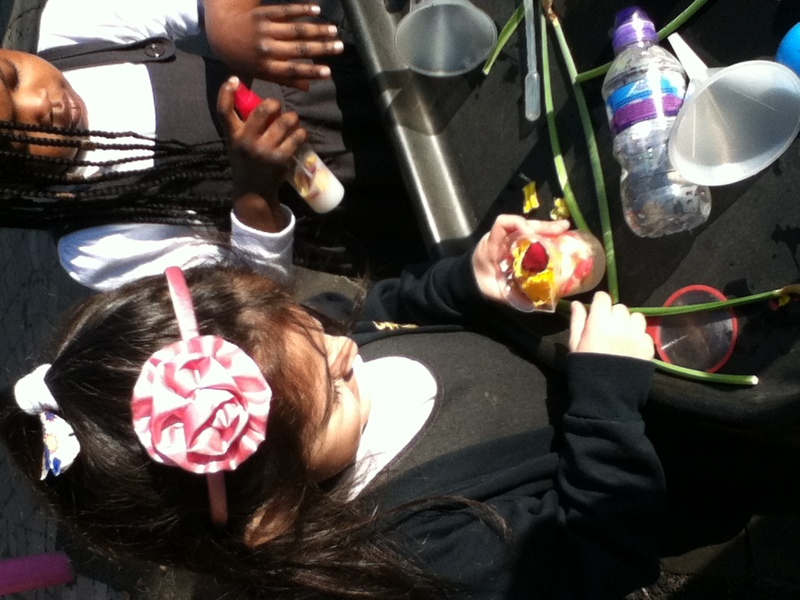 We even had some children decorate their perfume bottle to make it all fancy! 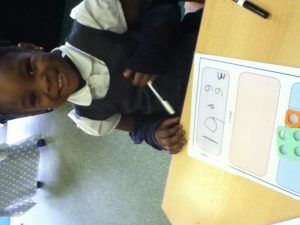 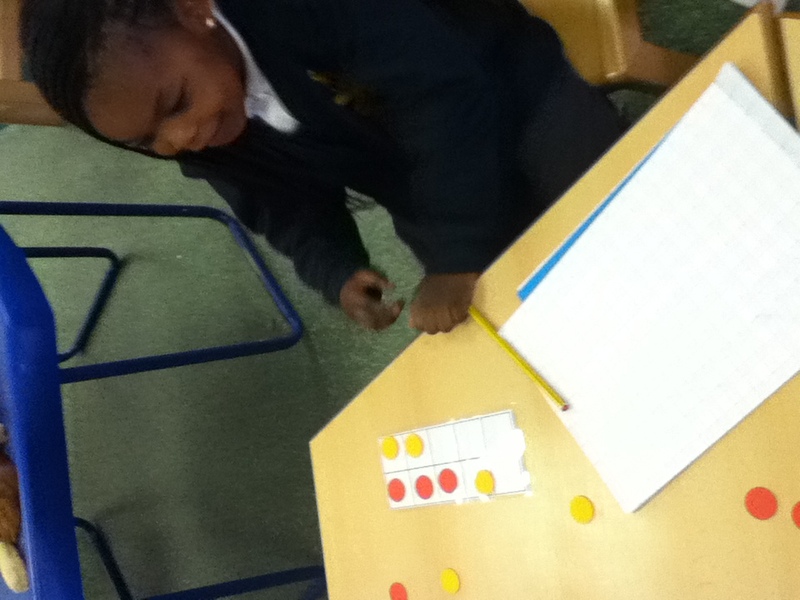 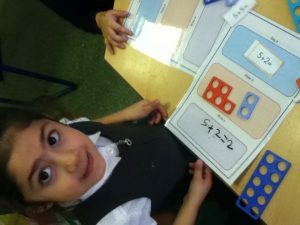 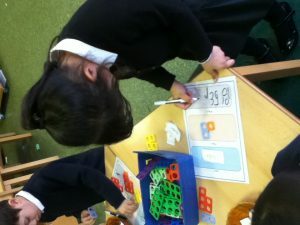 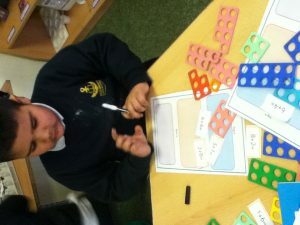 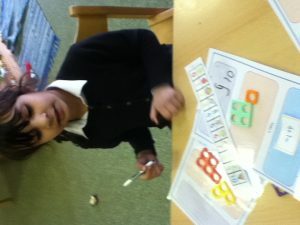 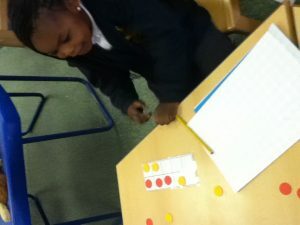 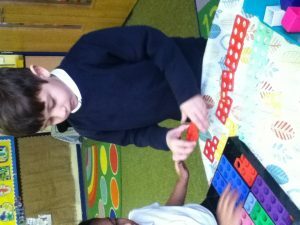 This week in maths the children have been working on addition. They have explored adding using different resources including counting bears, cubes, numicon and flip counters and tens frames. 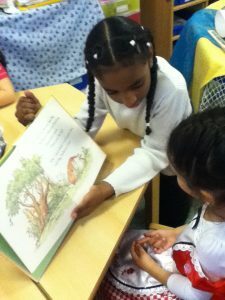 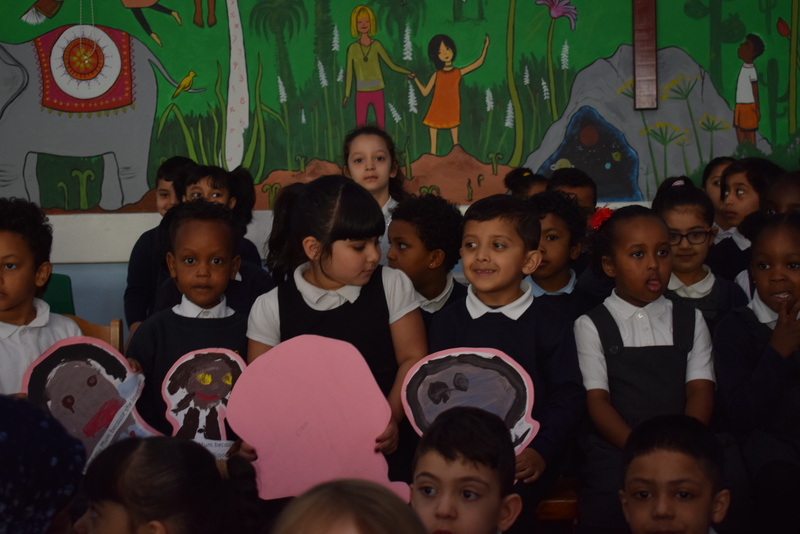 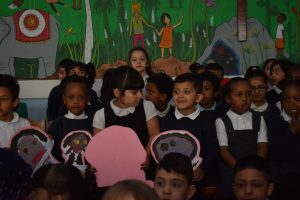 This week we have read the story ‘Owl Babies’. We learnt about owls and what they get up to. 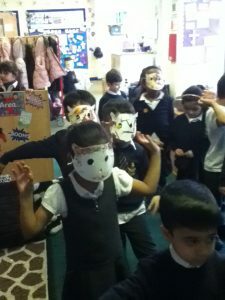 We learnt a song with actions. 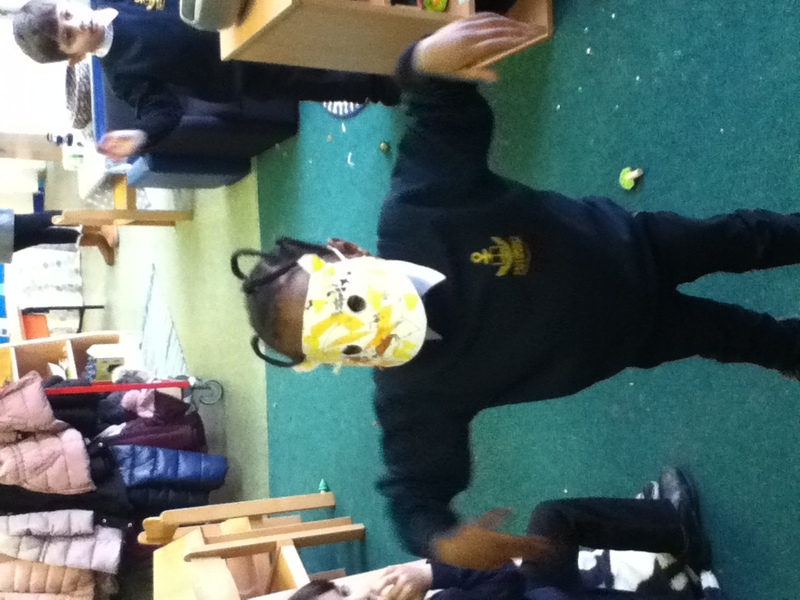 We had to flap our wings and dance around, hop, open our eyes big and wide, and turn our heads and say “hoot hoot!”. 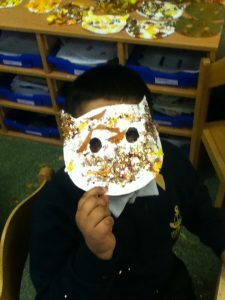 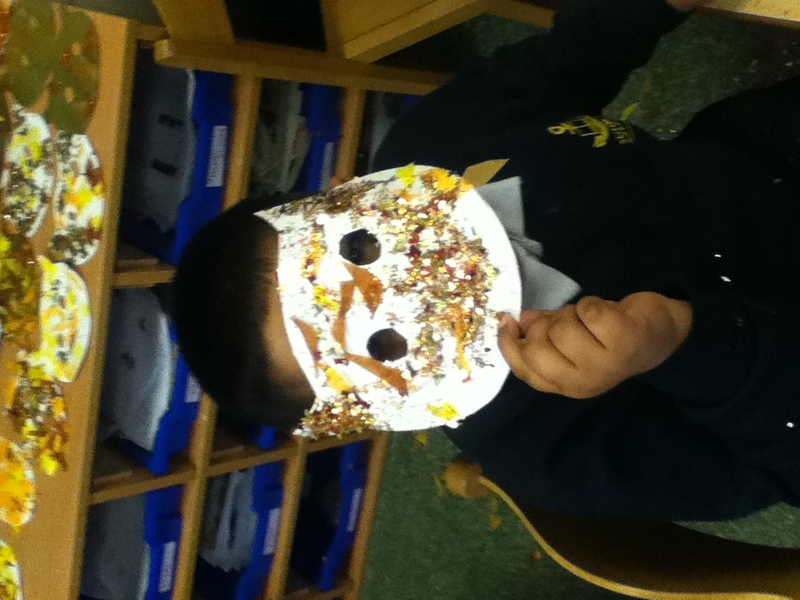 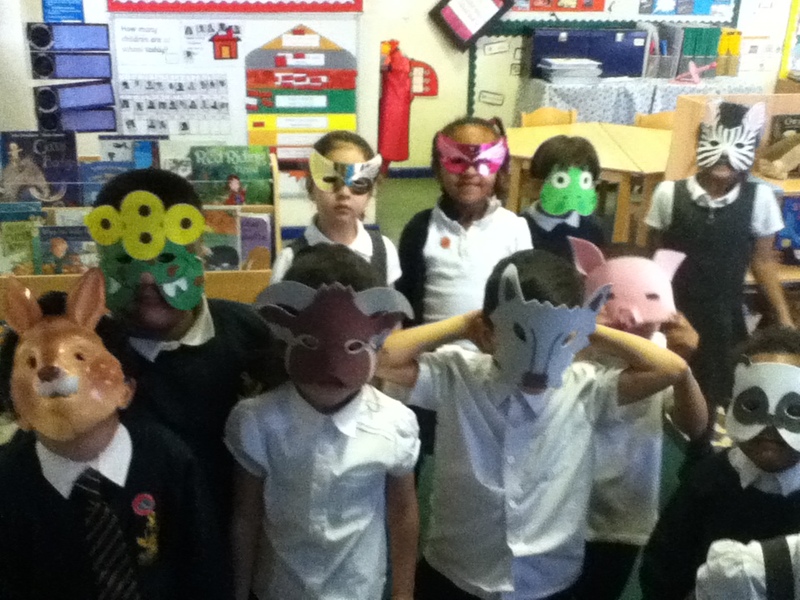 We also created our own owl masks for our dance. 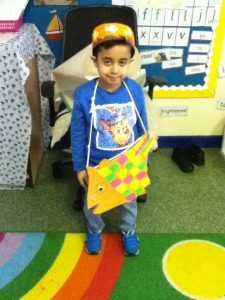 This week we have been reading the story ‘Rainbow Fish’ in Reception. 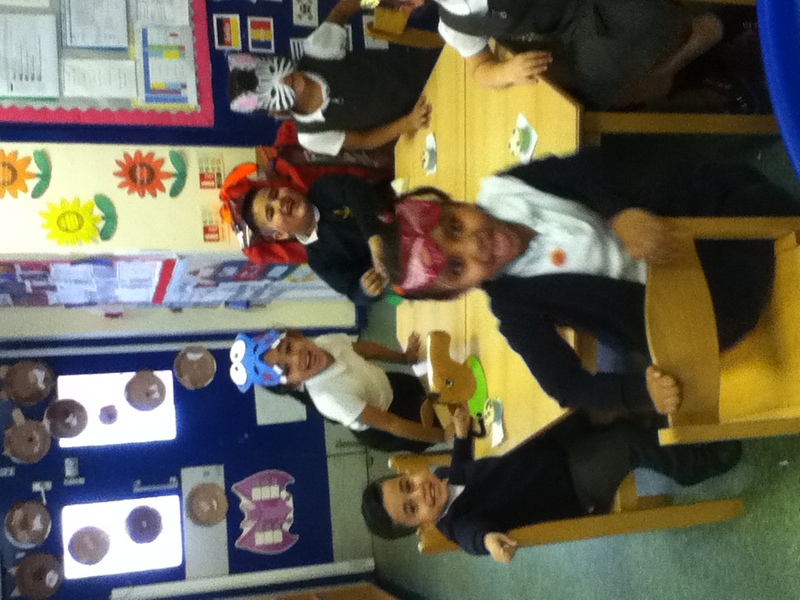 We have spoken about the character’s feeling and our own behaviours. 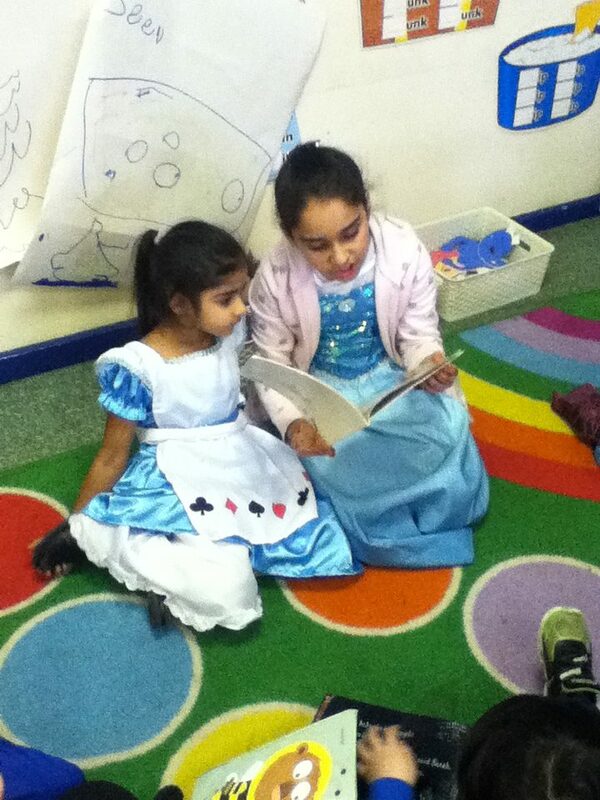 We have discussed how to be a good friend and what good behaviour is. 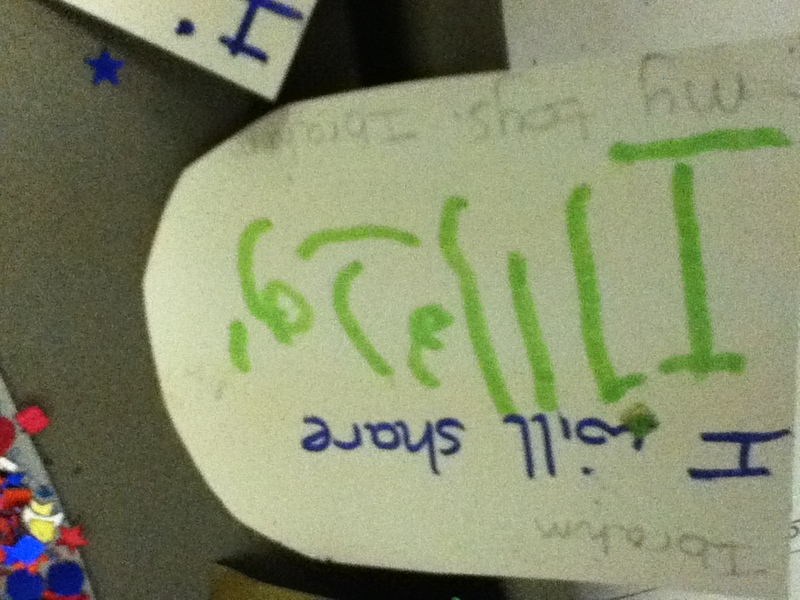 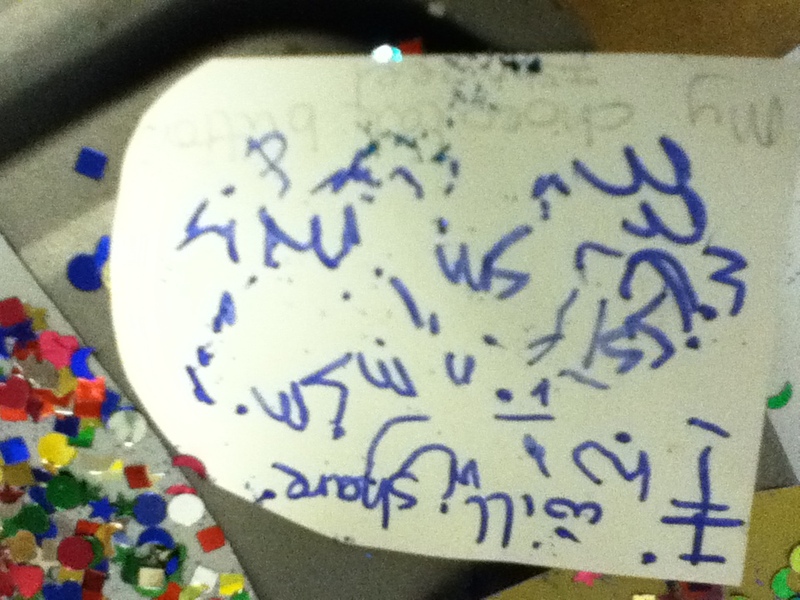 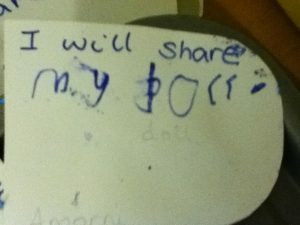 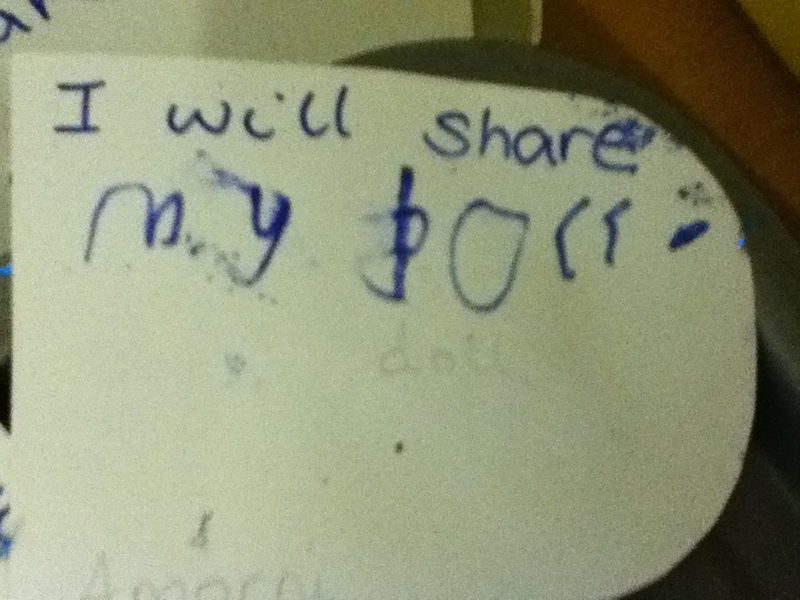 We also talked about how we can share things like the rainbow fish shared his scales. 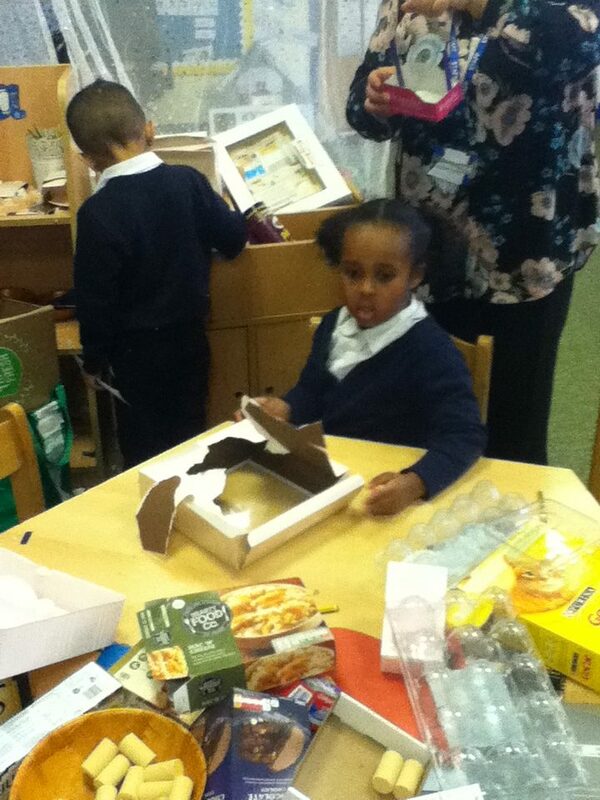 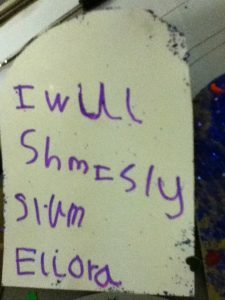 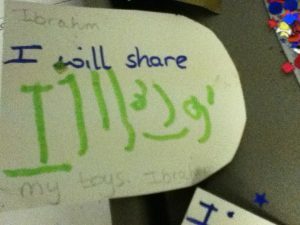 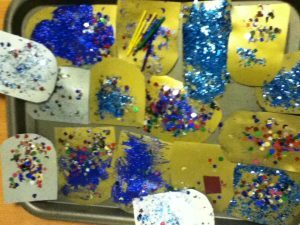 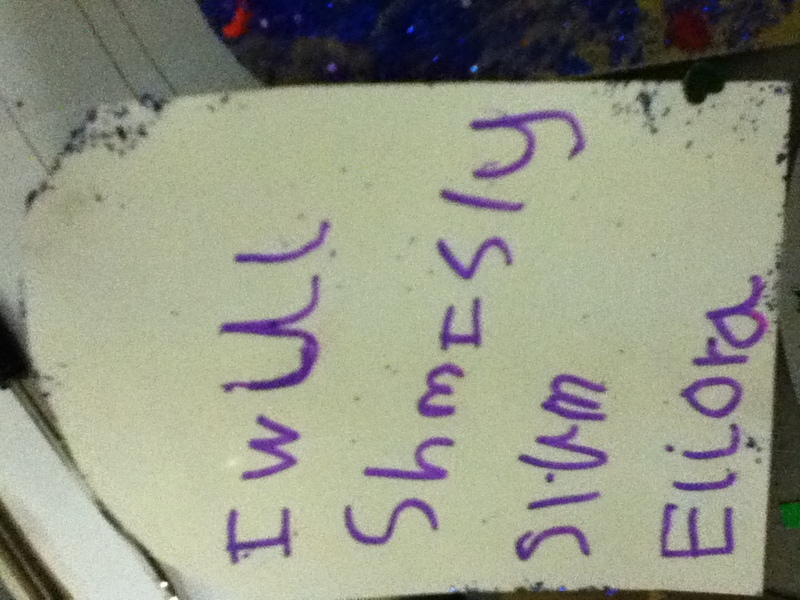 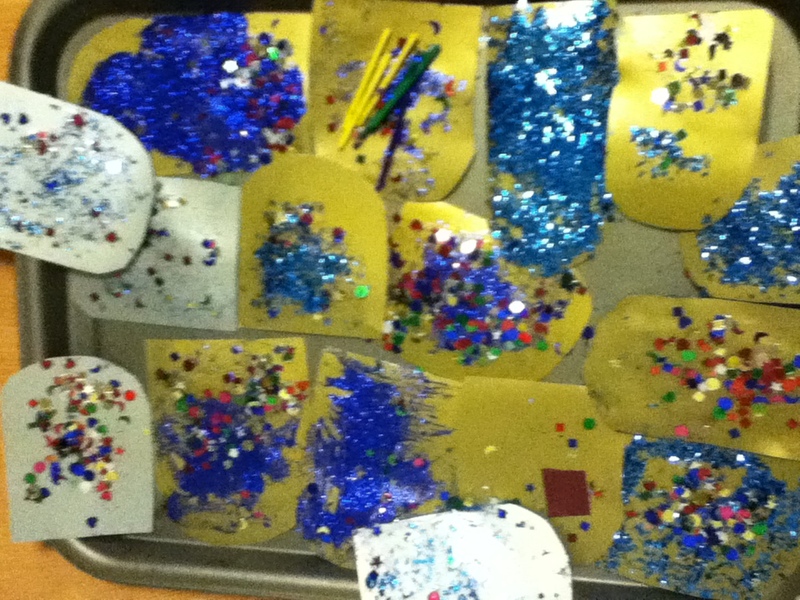 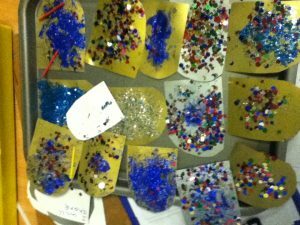 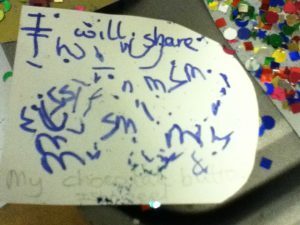 The children wrote down their ideas on a scale which they then decorated. 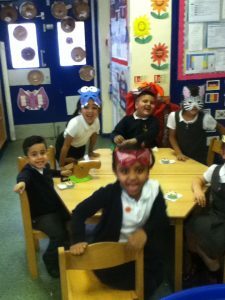 After reading, watching and doing lots of work around ‘The Tiger Who Came to Tea’ we thought we would do our own tea party. 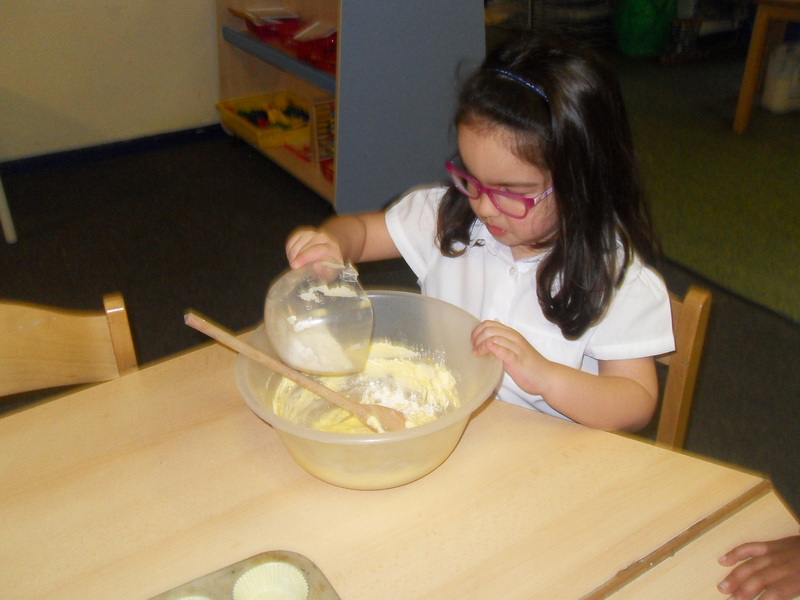 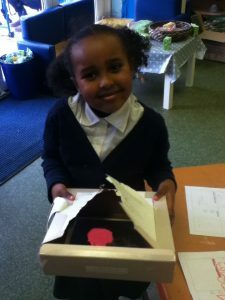 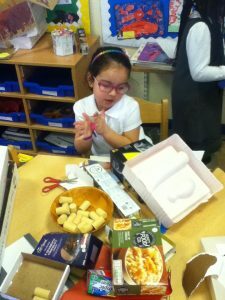 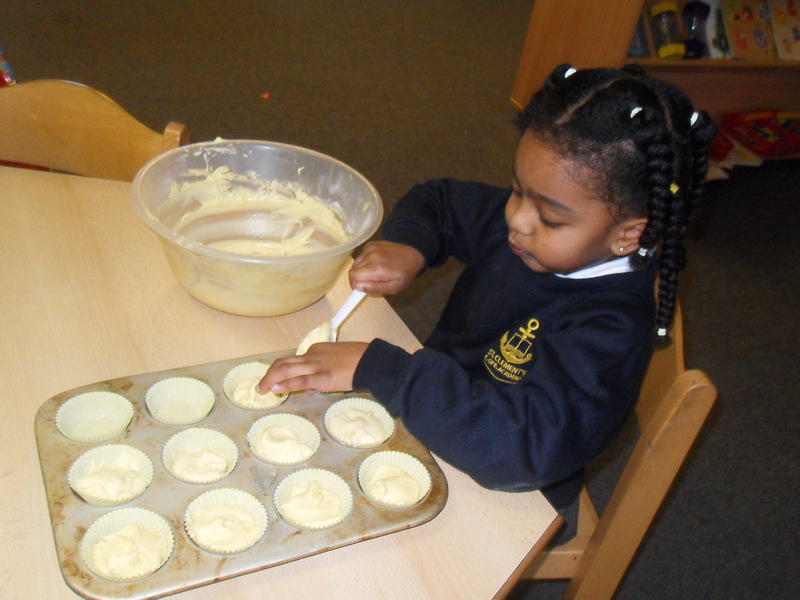 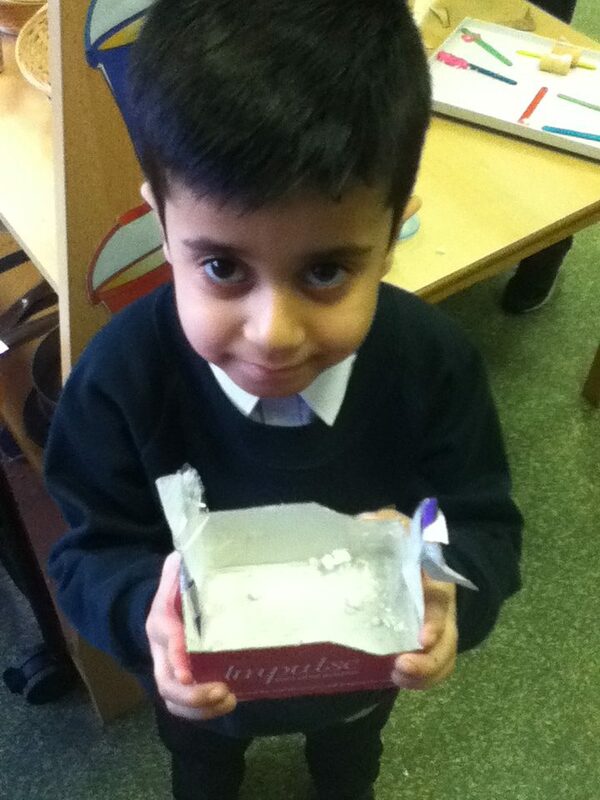 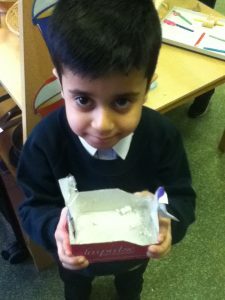 During the week the children made cupcakes using balance scales and decorated them with icing and chocolate chips. 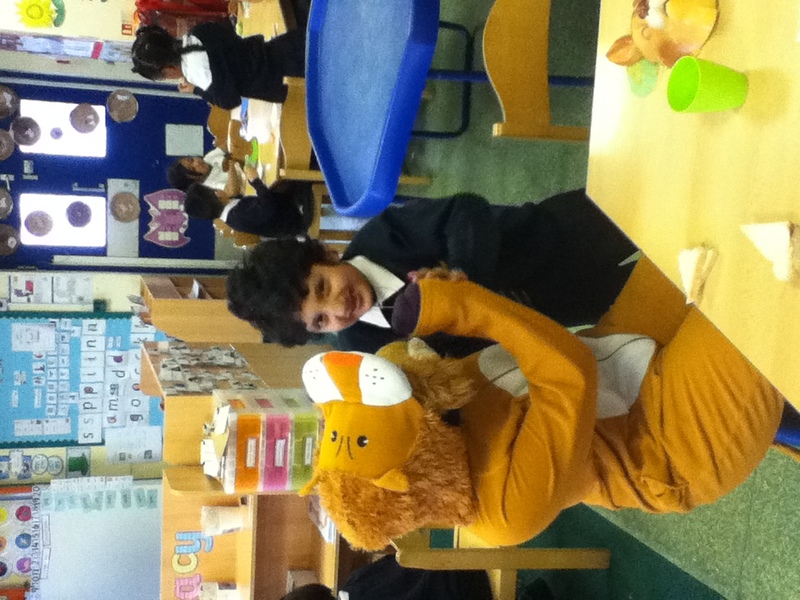 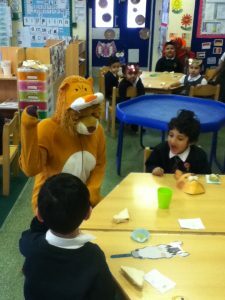 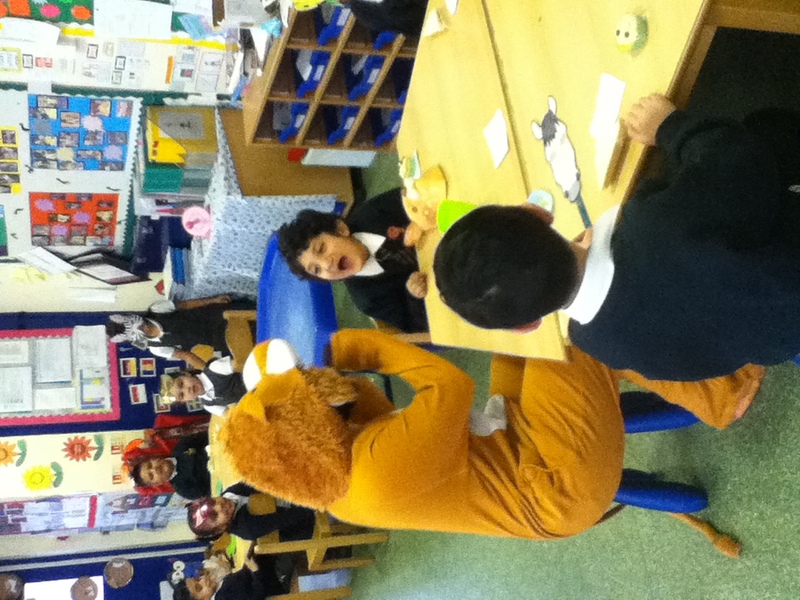 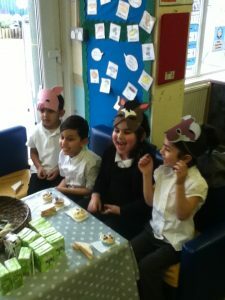 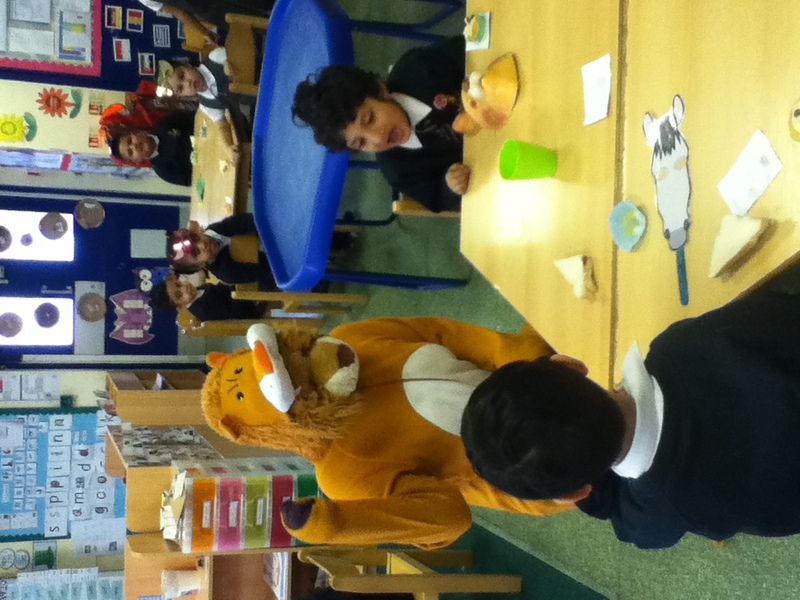 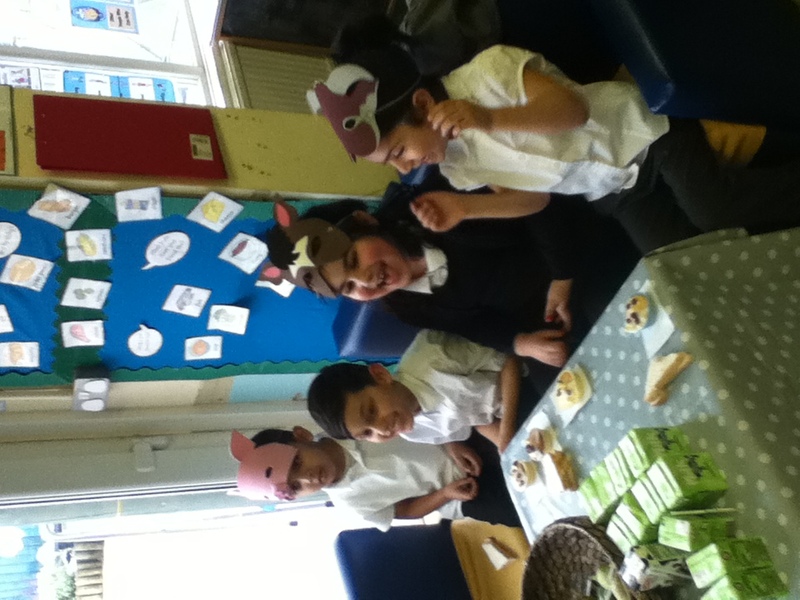 We came to the tea party as different animals and we even had a special guest!